NYC, 02/21/2019, 2:00PM. 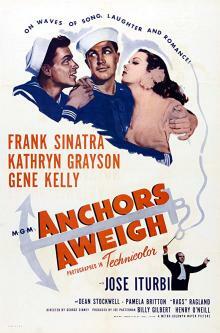 Anchors Aweigh (1945): Oscar winning musical comedy. Starring Frank Sinatra, Kathryn Grayson, Gene Kelly. Anchors Aweigh won the Academy Award for Original Music Score. It has four other Oscar nominations for Best Picture, Best Actor in a Leading Role, Best Cinematography, Color, Best Music, Original Song.